Reference MWAPI shows readers how to develop robust Windows applications using the innovative M Windowing Applications Interface (MWAPI). This book uses numerous tables, illustrations, sample programs, images and discussions to demonstrate how high quality graphical user interface applications are created using a technology that insulates the user from the intricacies and complexities of any particular Windows environment. It shows how applications created through the host-independent development environment can be ported to any Windows platform with no change in source code while maintaining the look and feel of event-processing methodology. It examines portability and compact code, some of the traits the MWAPI shares with the Java programming language. 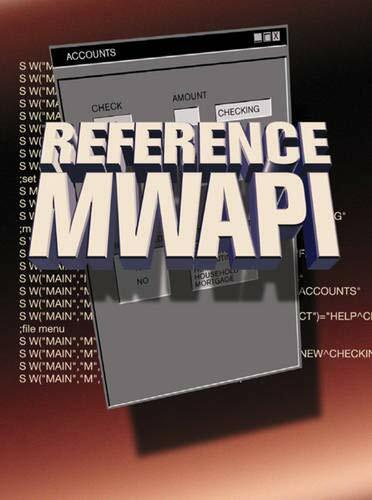 Reference MWAPI includes valuable appendices designed for quick reference, and it is organized with the needs of a developer in mind. The material is structured to serve as a learning tool and resource for applications development. The integration of the MWAPI is divided into seven chapters that focus on particular components of the system. Exercises test the knowledge of the reader on selected highlights of each chapter. James Hay, analyst/programmer with Uniband, Inc. He is a programmer who has been using M and instructing others in M and MWAPI for many years. He has written articles on M for M Computing Magazine and the Valley Business Journal.